When natural herbalist Megan Douglas sat down to create her beauty product line River Veda, she knew from the get-go that she wanted to create a socially conscious company, a line of products that would not only enhance natural beauty, but benefit the world. River Veda’s products are consequently everything from organic and eco-friendly to fair trade and animal-friendly. 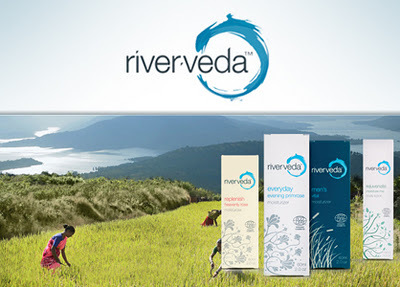 River Veda’s products come straight from the natural world and not a lab. By harnessing nature’s bounty, the company reaps powerful therapeutic benefits, using plants as medicine. I was really interested in where the name "River Veda" came for a skin care line. Rivers represent water, its purity, fluidity and healing properties. Rivers connect people, communities and countries. ‘Veda’ an ancient word comes from the Sanskrit language and is derived from the verb root vid, 'to know'. 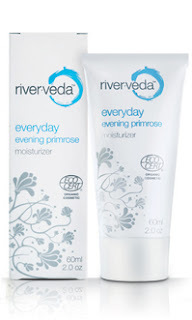 The Evening Primrose Moisturizer is a luxurious facial moisturizer that provides an enriching combination of supercritical herbal and oil extracts including Nutmeg, Ylang Ylang and Evening Primrose Oil. This bioactive cream is formulated to protect and enhance during the day and also stimulate the natural process of replenishment and renewal as you sleep. I have been using the cream for only a week, but I'm extremely impressed. At first the scent threw me off a bit. It smells of aloe vera and rose, but I also think it smelled a bit like fish oil. I never judge a skin product by it's scent though, so I applied the moisturizer morning and night, and my skin has never felt so soft or moisturized. I actually found myself not needing as much foundation as usual because my skin looked much healthier. I usually apply a tinted moisturizer under my NARS foundation, but no longer. The fact that this is a vegan product is also an added plus. All natural is always the way to go with skin care. The River Veda Rivival Eye Cream with Rose Attar and Shatavari is formulated to help prevent the signs of aging around the delicate area of the eyes. 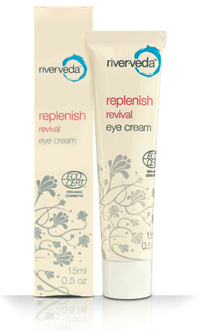 Carefully formulated with select supercritically extracted herbs and oils, Revival Eye Cream helps to decrease puffiness and dark circles around the eyes and minimize the appearance of fine lines. I tried this cream for one week and so far no drastic results, but I do like the consistency and the thickness. I do notice a slight difference in my dark circles under my eyes, and I look more refreshed and awake. One of the key ingredients is Amla/Indian Gooseberry which I've talked about in the past. It is one of the best Ayurvedic herbs to treat skin inflammation and allergies, encouraging healthy balanced skin. Extremely high in Vitamin C its is a powerful anti-oxidant and free radical scavenger. It can be very useful in restoring a smooth surface to skin and balancing skin tone, sebum production and surface oil. Vitamin C is an essential nutrient for the formation of collagen, the fibrous protein that contributes to skin firmness. I find that patting the cream around the eye instead of rubbing it in makes the results much better in the long run. I will continue to use this cream in hopes that my crow's feet will start to fade and the skin around my eyes will firm up. But for now, I'm happy with the darkness under my eyes diminishing. Overall, I found that River Veda is a great Vegan company with all natural ingredients. In the past I've found that many all natural skin care companies are less effective then others, but River Veda proves my theory wrong. If you are have dry skin and are looking for a way to replenish and moisturize, River Veda is an affordable natural way to get a brighter beautiful face. You can purchase River Veda Skin Care at River Veda's website. Disclosure: A press sample was sent for consideration from PR for the purpose of this review. All opinions are my own. No monetary compensation was received.